. . . born and raised in The Bronx, New York and coming from an Italian Family I was always around music like Sinatra, Dean Martin or Jerry Vale; as I got older I discovered Rock and Roll. At ten years old I started taking guitar lessons. Back in those days they tried to get you to play songs like Bill Bailey or Little Brown Jug. I wanted to play Beatles stuff!! After a couple of years I got bored with it, it was only when my family decided to move to South Florida a few years later that I picked it up again. From 1984 -1990 my family owned The Blue Midnite Blues Bar in Ft. Lauderdale, Florida where I was part of the house band ”The Midnite Blues Band” which included guitarist Harvey Mandel. Musicians such as Albert Collins, James Cotton, Elvin Bishop, Jaco Pastorias, Sugar Blue, Roy Buchanan, The Blasters, Junior Wells, Billy Preston, Bobby Keys, Robert Lockwood Jr. and Los Lobos all hung out and sat in with the band. That was my Collage education, meeting and playing with these guys at my age was priceless!! Around 1988 I joined “The Hurricane Blues Band” and went on the road… lots of fun playing some real funky Blues clubs!! After the Hurricanes disbanded I returned to Florida and put together a new version of The Midnite Blues Band featuring former Allman Brothers Harmonica player Thom Doucette. With this line up we played a weekly gig for Ronny Wood of the Rolling Stones at ‘Woody’s club on Miami Beach. Playing with “The Blind Tigers” in early 1990 as one of the two house bands at Bon Ton Square Club in Ft. Lauderdale I got to play with Zachary Richard and Clarence "gatemouth" Brown; and played gigs with Bo Diddley. Later that same year I was asked to join “Kilmo and The Killers". This band got me to stretch out on guitar a lot more; playing a lot of fired up Blues, R&B and funky New Orleans material, focusing on more soloing. It was with this band I performed with Dan Ackroyd and opened up for the likes of Johnny Winter and Jeff Healy. Four years later drummer Reggie Smith and I formed “Midnite Johnny and Smokestack Lightnin’ Along with bassist Jim Kessler we became a very powerful trio; focussing on more of a funky Blues/Rock sound. 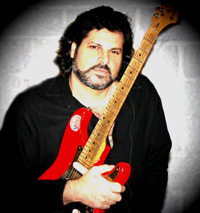 This line-up continued until 1994 when John Grillo – drums and Jeff Sanchez – bass/vocals joined the band followed shortly after by Stan Bronstein – sax and Sonny Williams – keyboards. This same line-up remained constant for 14 years. While I am still performing the Rockin’ electric Blues for which I am known; more recently I have been working in Greece but also I have been focusing on acoustic performances and on projects scheduled in and around the UK.